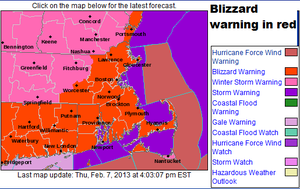 Blizzard warnings are now in effect for nearly the entire coast from central Maine south to New York City. If you need to get out tomorrow, the morning will provide the best travel conditions. Roads will become snow covered in the afternoon and travel nearly impossible after dark. Tides are high around 9:30 PM Friday and again at about 10 AM Saturday morning. Both of those tides will have to be monitored closely for coastal flooding and beach erosion. Winds along the coast will reach speeds of 50 to 60 miles per hour and this will blow and drift the snow. Inland areas will have less wind, but could see wind speeds over 35 miles per hour at times. When the storm is over, 1 to 2 feet of snow will have fallen across much of the area. 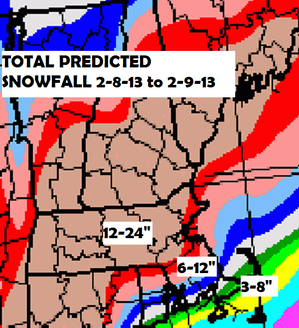 There will be less than that over Cape Cod and the islands as the snow will be wet and mixed with rain. There is still uncertainty as to how much rain may or may not mix into the storm in those areas and that will greatly impact storm totals. The reason the estimated accumulations have such a large range,are that in these very intense storms thundersnow or banding can rapidly add 8-12 inches of snow to an area in just a few hours. Today, some of the computer models will start to indicate if the storm will produce thundersnow or heavy banding (which has extreme snowfall rates) and that will allow me to be even more specific with the final amounts. Since the late 1800s there have been only 13 storms where Boston has surpassed 18.1″ of snow. Three of those storms had total accumulations of 18.2 inches: January 7-8, 1996, December 20-22, 1975, and December 26-27, 2010. From there the totals of other historic snowstorms increases until February 2003. That year Boston saw a storm with 27.5 inches of fluffy snow, the largest amount ever from a single storm. Number 2 in terms of snow totals was the Blizzard of 1978, 35 years ago today at 27.1 inches. I think the word historic can be applied to any storm that ends up in the top 10 in our record books. The point of all these numbers is that in all those years, very few storms ever reach historic proportions. Also, a large amount of snow does not always make for a memorable storm. Boston’s largest snow event, the one that occurred 10 years ago. How many of you remember that particular storm? The snow was dry, it occurred on a weekend and roads were clear a day later. I remember being on-air and remarking how that was the tamest blizzard I had ever seen. 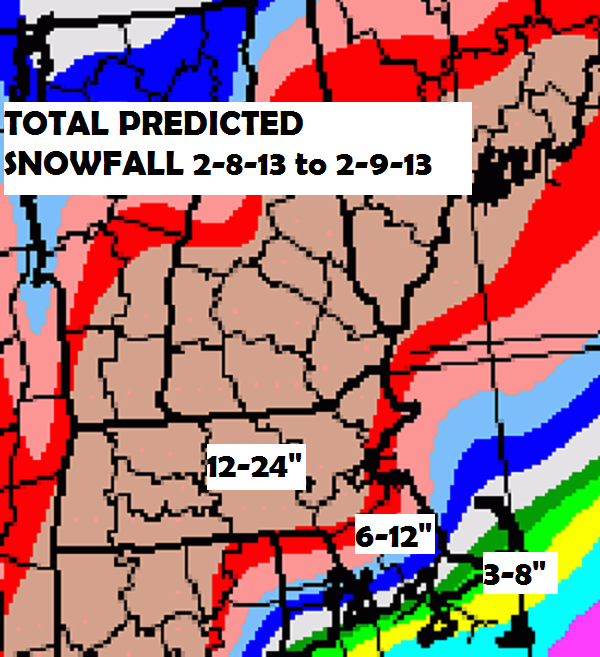 Statistically speaking, the odds are against Boston getting over 18 inches of snow, but storms don’t follow statistics. 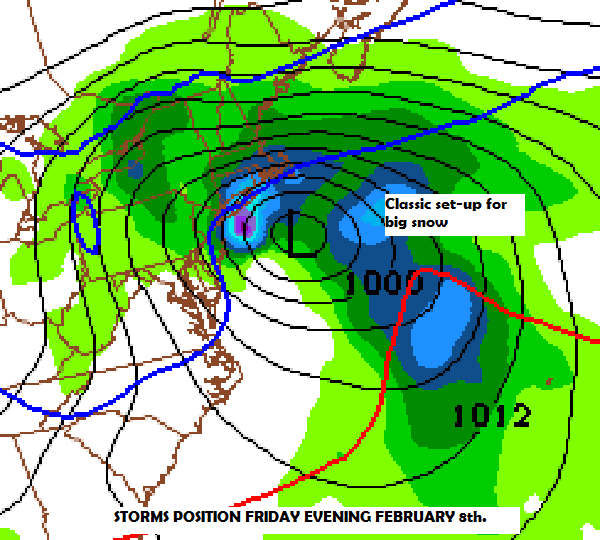 For the storm Friday night to become historic a lot has to happen. Every key ingredient in the atmosphere must come together in just the right way. Snowfall rates will need to approach 3 inches per hour at least for a few hours. If, for example, it snows at 1 inch per hour from midnight until 5 AM that is going to give us 5 inches of snow, but imagine getting 3 inches per hour during that time, now you just added 15 inches to your total. For Boston and other towns to see final amounts over 18 inches we need to have some incredibly intense snowfall rates for at least part of the storm. For an official blizzard to end up in the record books our winds must remain sustained at 35 miles per hour or higher have to coincide with the very intense snow. Visibilities need to be recorded under 1/4 of a mile for three hours or longer. Sometimes, in these storms a town like Quincy could experience blizzard conditions while 30 miles away in Framingham winds are just under blizzard criteria. We won’t know who ends up in a full-fledged blizzard until the storm is underway. 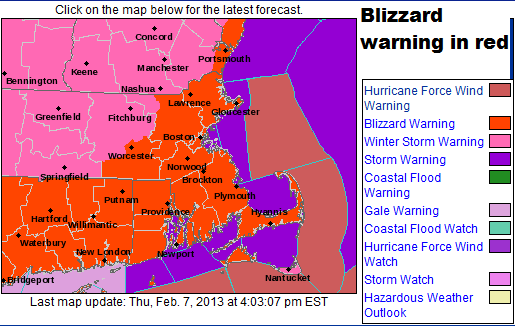 There have been many storms with near blizzard conditions, but very few ever reach blizzard criteria over a wide area. When the storm is over Saturday afternoon how bad it was will be a matter of opinion. If you don’t lose power and the worst you have to do is shovel a lot of snow, you might think the storm wasn’t so bad. If a tree falls on your car or your house the storm becomes more memorable for you and your family. For anyone that loses an entire home, or God forbid their life, the storm will be catastrophic. This is the hard part of forecasting and conveying what the storm will be like before it occurs. Everyone has a different opinion on what makes a bad storm. For some, unless the entire east coast is shut down for a week, they would think the storm wasn’t so bad. For others, not being able to go shopping Saturday is a catastrophe. I tend to fall in the middle somewhere. The reality is that nearly everyone who reads this will come through the storm Saturday night about the same as they went into it. Is this storm a footnote in an otherwise tranquil winter? Perhaps this does become a blockbuster storm that begins a snowy second half February and March Maybe it will even be called historic. I’ll continue to work through those questions until the storm is over. Of course in the end, only you can decide how bad this really was. This week I wanted to share a video that shows a very unique water garden. This particular water garden contains many different varieties of fish. While you might not have the space for something this elaborate, you can mimic some of the elements on a smaller scale.